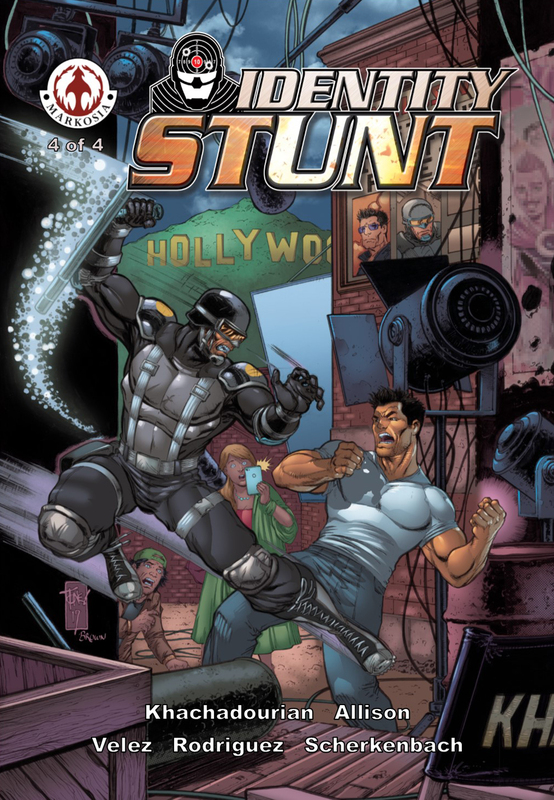 Pullbox Reviews: Identity Stunt #4- Punches, Kicks, and Quips abound! Available digitally, January 2nd, 2019! The dawn is about to break and Sami Nasser’s adventure of a lifetime is about to come to its frenzied conclusion! Back-to-back with the unhinged vigilante, Beatdown, and surrounded by a legion of ganglord Dominus Smith’s horrors, “Sam” will stop at nothing to rescue his family. Even with the surprising faces aiding Sam in his darkest hour, will their Hail Mary play be enough? As the sun rises and the dust settles, some questions are answered…and more are asked, setting up the next mind-blowing chapter of Sam Nasser’s life! Capturing the bombastic tones of ‘80s and ‘90s action films, writer Joe R. Khachadourian (Transformers: Mosaic), artist J. Briscoe Allison (Sweet Lullaby), and cover artist Tone Rodriguez (The Snake Plissken Chronicles) bring you a relentless odyssey involving complex characters, a touch of romance, and a fistful of masked lunatics! If you read that opening paragraph and got even half of the references, this review should be a pretty easy sell (also, I think we could be friends). 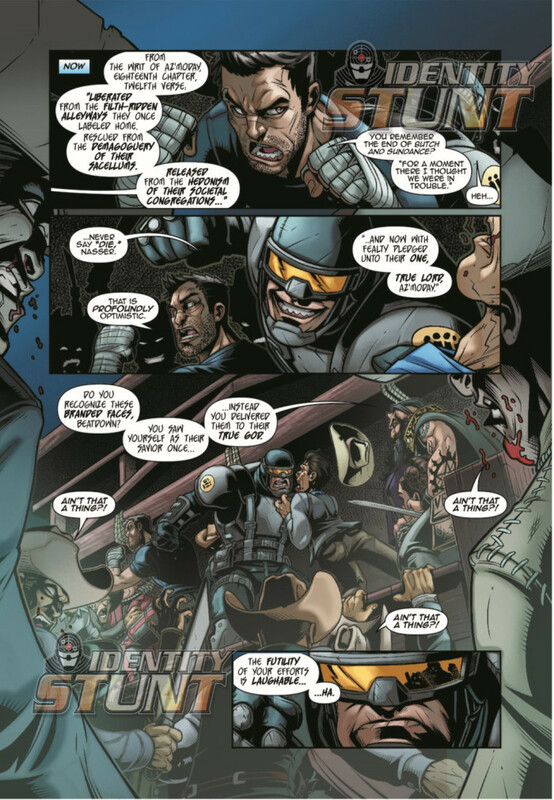 Unofficially announced in the question/answer segment on an episode of Kevin Smith’s and Marc Bernardin’s Fat Man on Batman podcast, Identity Stunt is an homage to the action movies born out of the 80’s & 90’s, and I’ve been a fan since the beginning. The world as it exists in this title isn’t a literal translation of where we all live and breathe. It’s the home of people who spend a lot of time in gym, almost all of whom are inexplicably masters of the martial arts… not a single style, mind you, but ALL of the martial arts. I’ll never forget where I was when creator/writer Joe Khachadourian sent me a copy of Identity Stunt’s first issue for review. 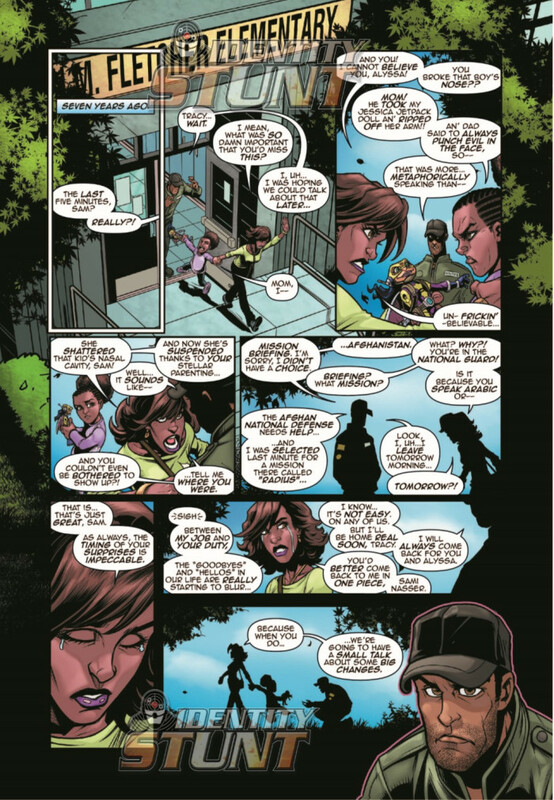 I was sitting in front of my computer, where I usually am when checking my emails for thePullbox (sure, a lucky guess), when up pops a message asking me to take a look at this unpolished gem of a comicbook. Now I don’t say unpolished because Khachadourian’s work lacks refinement… okay, it does lack refinement, but only in the best possible sense of the word. Let’s face it, the action movies of yore weren’t in any way what many would call “good”, but to those of us who cut our action flick teeth on those old VHS tapes featuring the likes of Chuck Norris, Steven Segal, Jeff Speakman, and Cynthia Rothrock they provided countless hours of high octane escapist bliss (pretty sure I’ve worn out at least two copies of The Perfect Weapon). 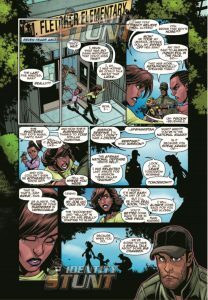 Does Identity Stunt have a few plot holes, maybe some all-too convenient resolutions? You bet! But that’s just one more thing that Khachadourian did right as he captured the essence of the entertainment genre he very obviously loves. 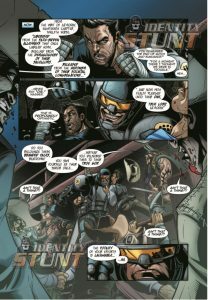 Continuing the awesome work begun in issues 1-3, J. Briscoe Allison (no relation to County Jr) delivers some outstanding artwork for the title’s conclusion, his style reminding me very much of Ed Mcguiness. The characters are larger than life and more buff than Van Damme in his prime, and the action is dynamic as the epic final fight crashes across the pages. 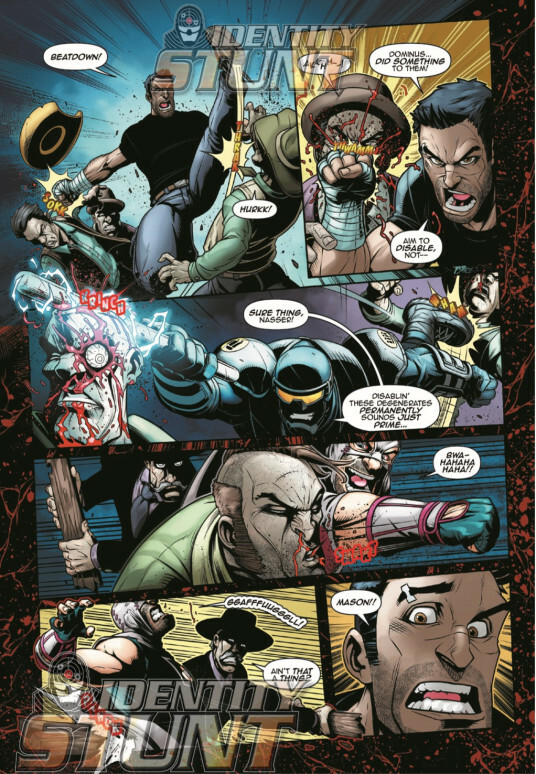 Not to say that Allison’s work is all flash with no substance as he does squeeze out some fine character moments in between the fisticuffs (and footicuffs? ), as few and far between as those moments may be. The title’s visual appeal is helped along by Juancho Velez (which is in itself a name that begs to be included in any action opus), who’s colors bring depth to every arterial spurt. A. J. Scherkenbach brings the last touch to the work with his letters, differentiating dialogue between multiple characters and punctuating every bone crunching blow with such touches as “KRINCH”, “SPRAKT”, and the occasional “THTOK” (honestly, kids, if you haven’t developed an appreciation for good lettering in a comic, you haven’t seen a true example of BAD). 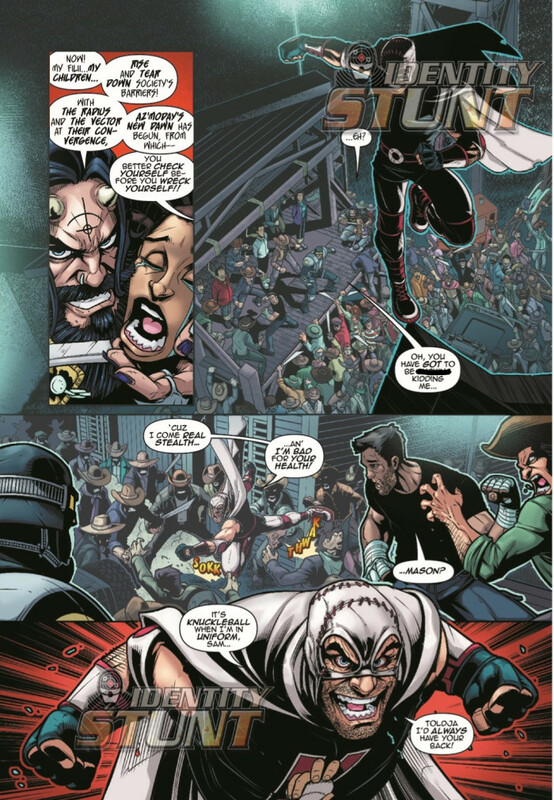 Issue 4 will be available digitally through ComiXology on January 2nd, 2018, and there’s a trade paperback planned for early in the year, so get ready… In the end, I choose to believe that a person can effectively deliver a Scorpion Kick in a street fight, and that it don’t gotta be Shakespeare to be entertaining. 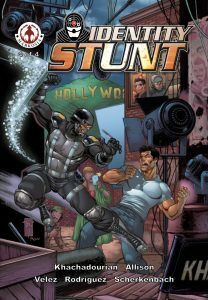 For the younger crowd, think of Identity Stunt as a combo bringing elements of John Wick and The Expendables careening along at a pace both Fast & Furious.